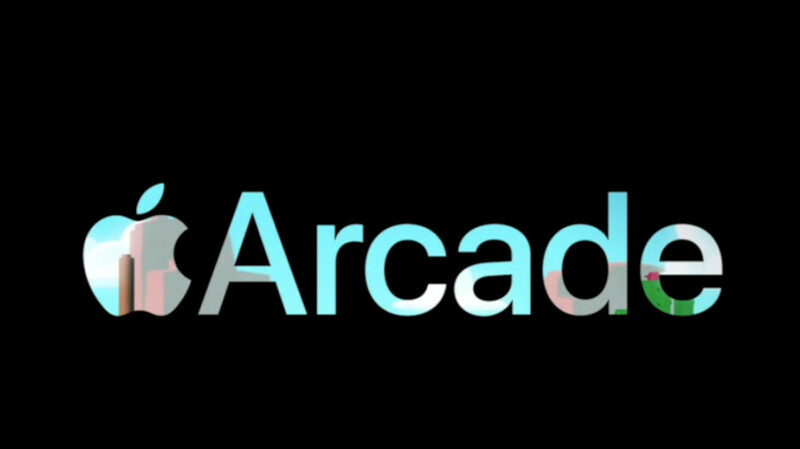 Last month, Apple Arcade was unveiled. Set to launch this fall, the service will offer subscribers access to over 100 "groundbreaking" new games. The Arcade will be available on all Apple devices including the iPhone, iPad and the Mac. And the only cost will be the monthly subscription fee; there are no in-game extras that Arcade members will have to shell out for. Besides allowing a family with up to six members to share, a whole new family of accessories certified MFi (made for iPhone, iPad), such as game controllers, will make playing games on an iOS device much easier. With iPhone sales struggling, the company is looking to take advantage of the large number of active units (nearly 1 billion at last count) by selling owners of these handsets subscription services such as Apple Music, Apple News+, Apple TV+ and Apple Arcade. Apple is looking to double its services revenue from the $25 billion it collected in 2017 to the $50 billion it hopes to garner next year. For the fiscal first quarter of 2019, the period covering October through December of last year, Apple grossed nearly $11 billion from its services unit, putting it on track to meet its goal for fiscal 2020. According to the Financial Times, Apple has budgeted more than $500 million this year to spend on games for Arcade. In other words, the company is spending millions of dollars on each game. Will there be a payoff for the company after it keeps cutting such large checks? Global banking giant HSBC believes so. The firm's analysts see Apple Arcade grossing $370 million next year, overtaking Apple TV+ by 2022 with $2.7 billion in sales, and generating $4.5 billion in revenue by 2024. 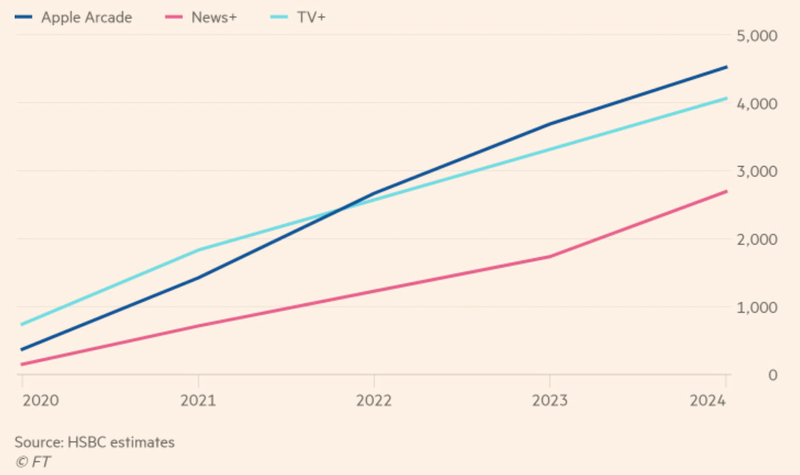 In that year, HSBC expects Apple TV+ to bring in $4.1 billion in revenue, while Apple News+ takes in approximately $2.7 billion. The $500 million Apple has reportedly budgeted for Arcade is half the $1 billion it originally expected to lay out for Apple TV+. Games already announced for Arcade include one based on Sega's popular Sonic the Hedgehog character. Subscribers will also be able to select titles from Cartoon Network and Lego. There will even be a new version of Frogger available. Independent developers, who have proven themselves with games listed on the App Store, have received larger than normal advances from Apple to deliver new titles for Arcade. HSBC forecasts that Apple Arcade will have 29 million subscribers by 2024, paying $12.99 a month for the service. But that is only an estimate. Only time will tell whether Apple has made the right move by laying out half a billion dollars for new, unproven games for its service. And if Arcade ends up being a big money maker for Apple, competition will surely follow. Still, Apple will have the advantage of plucking (ahem) apples from the low hanging trees. Those are the nearly one billion owners of an active iPhone who will be receptive to Apple's marketing of Arcade. The money is in services (the more the better), so I'm sure this will pay off for apple in a year or two. You should check out Stadia... will be killer once it gets populated with more games etc. I'm not an expert at financial reports, but is there any rule saying what can go in which category for revenue? If Apple doesn't break anything out anymore, It will be hard to gauge how successful each service is. 99% of the $50B Apple is expecting can come from anything... Google paying 20% just to be the default search would make reaching this goal easy, add in in-app purchases money (which I don't consider a "service", but I don't consider Payment and insurance a service either) and you can easily reach $50B without even launching News+, ARcade, or TV+. I ask my original question to see if it's possible that Apple could take iPad sales and count them under services since they don't break anything out. Or maybe they do break it out enough to be able to tell, I'm asking because I don't know. I would love this game subscription instead of buying game app with in app purchases. No ads, no in app purchases and can play offline is the best game experience. Hope apple to make controller for my 2 apple TV. Apple is trying to pull an Epic.